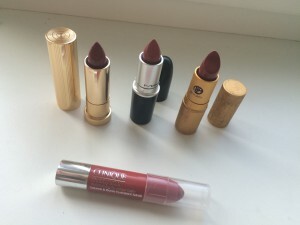 * Essence On The Catwalk, which I’ve seen called as dupe of MAC Hot Tahiti, a recommended lipstick for DA (by Cate Linden); it’s an almost perfect match colourwise, and fairly sheer so as not to be too strong for daytime use; my go-to brownish/warm red. * Rimmel Lasting Finish Heartbreaker, the perfect rosey dark pink for me, not too cool, as many such are. Also suits other than daytime use. * Wet’n’wild Copper Dust, a kind of coppery pink. Also I still have many coral pink or peachy lipstick from back when I thought I was a Spring, and I find many of those are fine too, especially for Summertime use. You sound less high contrast than I am… If you are finding that a lot of DA is too dark, I would look at SA, not TA–similar heat level, lower contrast. Brick O La is a lipstick that is different depending on who is wearing it, so I wouldn’t rule it out based on a dupe. Even if you don’t want to spend the money on MAC, you can still test it out at a MAC counter. I gave away all my Spring lipsticks. Spring lipsticks looked artificial/chalky on me. I live close to you and we have MAC counters in department stores, the main branch of a major makeup store chain, and then some individual MAC stores in some nicer malls. I would go on the MAC website for your country and do a search. Also MAC counters in general are all about testing the products on you. Most non-drugstore brand counters are. Oh, I wasn’t questioning it at all, though it sounded like you were 😉 I’m pretty sure I’m either DA or TA, by now (it’s been a long and winding road), but definitely not SA. Like I said, it’s only the dark lipsticks that don’t suit me well, but since practically everything else does, I have no reason to question it. I don’t follow any systems with Ethereal, but my suggestion would be to look for makeup that matches the lighter colors on the fan–corals, pinks, orchid, etc. It can be hard to find exact matches for these colors, but the Facebook group for DA has a list. You will still need enough darkness for things to look natural on you, but they should blend into you and not be disruptive to the overall Ethereal look.